They came, they saw, they conquered... and then they fell. But even though the glory of Rome is but a memory, they left behind a wealth of structures in their ancient colonies that are now part of daily life in the once-assailed areas. Once Rome established the colony of Britannia, it wasn’t long before Bath's hot springs became the stuff of legends. Right at the center of the city, the Roman Baths were built around 70 AD. 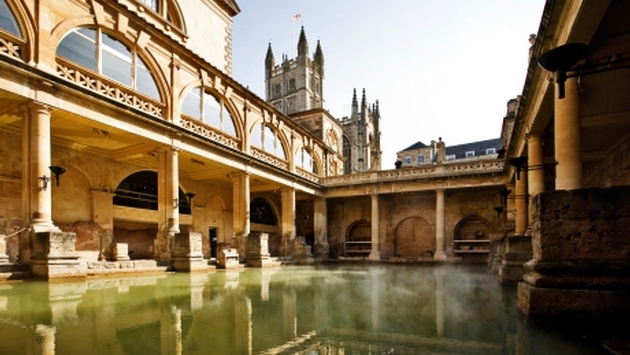 Thought to be the work of gods in ancient times, we now know that King’s Spring was originally rainwater, and is still feeding nearly 310,000 gallons of 115-degree Fahrenheit water into the baths daily. After experiencing the ancient-ness of the original Baths, along with a taste of revitalizing (so they say) water with 42 different minerals, head to Thermae Bath Spa for an actual dip in the waters. An appropriately vintage experience can be had at Thermae’s Cross Bath, a once-sacred site revered by both Celts and Romans. Like the Pantheon in Rome herself, La Maison Carree was preserved by continuous use during the turbulent fall of the empire. One of the best preserved Roman temples in the world, the building was originally dedicated to the “princes of youth,” the young grandsons of Emperor Augustus, who died tragically, and was but one structure that symbolized the Roman imperial cult in the area. Records have it as a medieval townhouse, then an Augustinian monastery until the French Revolution, when it’s archaeological significance was recognized. These formidable walls are seen by UNESCO as, “the finest surviving example of late Roman military fortifications.” It’s easy to mistake them as medieval castle ruins, but they were in fact built in the 3rd century AD to defend what was then called the town of “Lucus Augusti.” The local population had been pacified for a few hundred years, but when Frankish and Alemannic invaders penetrated Roman battle lines all the way from modern-day France into Spain, the walls went up in a massive construction campaign. A little more than a mile of the wall is preserved, with internal and external facing sandwiching a core of stone, earth, and scrap building material. Yes, you can climb onto the battlements, and yes, you can pretend to be a soldier fighting back against the barbarians. We won’t judge.